When remodeling a commercial space, one of the more difficult jobs is getting a smooth floor so you can lay down new tile or carpet. Minarik Drives was approached by a manufacturer of surface preparation machines designed specifically for this task. 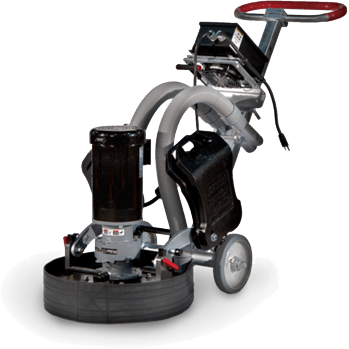 These machines scrape, grind, and polish the cement layer under existing flooring. The existing products used a 230 VAC, 3 HP motor and a variable frequency drive from a competitor. With this setup, the customer was experiencing constant tripping of the breakers on the 115 VAC line sources. In the floor refurbishment market, being able to run a grinder with 115 VAC wall voltage is appealing and convenient for users as not all locations have 230 VAC readily available. The problem is that when the output voltage is double the incoming voltage, the incoming current is double the output current. So when one of the grinder pads would get caught on something like a nail, these abrupt jams would cause current spikes. This in turn would cause line fuses to blow or trip sensitive circuit breakers. Seeing that these machines are typically rented on an hourly basis, this would be a hassle for any operator. Besides paying for time when they machine couldn't run, a lot of time would be wasted finding which fuse blew, which breaker to reset, or even looking for the right outlet to avoid this problem. Using our C4MDVF04-D230-PCM as a base, our engineers gave the control functionality that would counteract these current spikes. The drive monitors the input current, which isn't something you can find standard on an off-the-shelf VFD. When the control would hit a rough patch seeing the current spike, it would lower the speed of the motor while maintaining the torque required. This solution bundled with an enclosure and user friendly interface made it an ideal fit in this application. The customer was so pleased that they've requested other custom controls for other machines they've designed. This is yet another great example of how Minarik Drives was able to learn the factors and difficulties a manufacturer would encounter to design an application specific control.